Today all the snow's melted and it looks like spring outside :) only thing missing are the flowers! 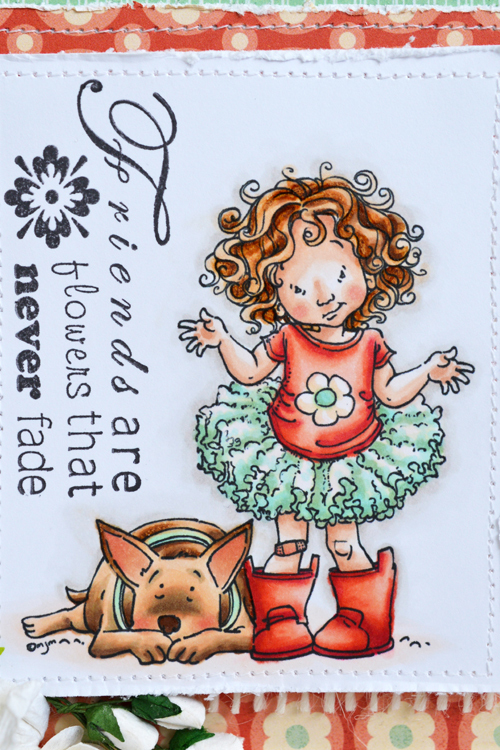 So that's why, to make my card, I've chosen the sweet sentiment about friendship "Friends are flowers that never fade". with a digital image from Cuddly Budly. My basic paper is Straw Cardstock from Bazzil. The color from this paper match very good by so many dessin papers. 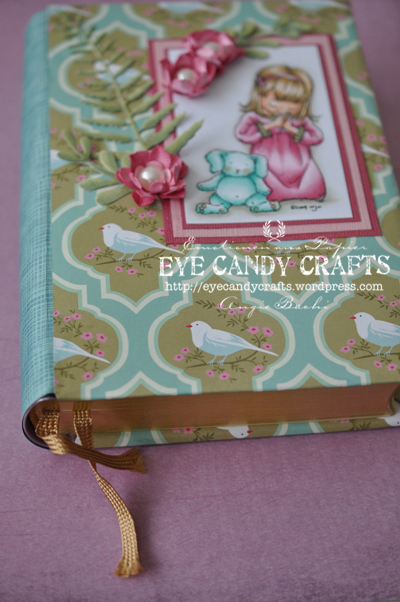 It's one of my favorite cardstock at the moment. 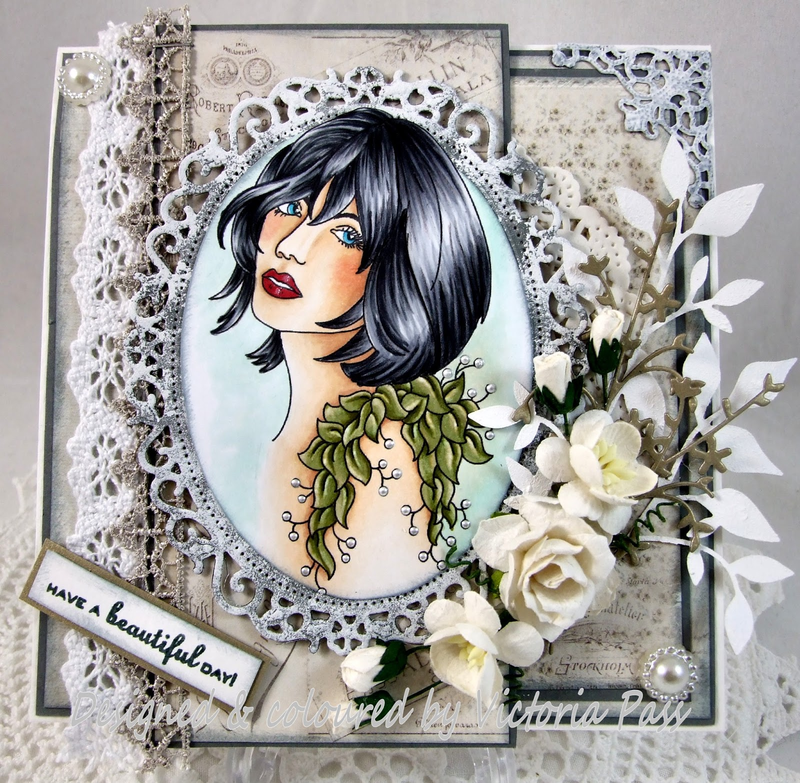 The dessin paper is from a paperstack from Basic Grey "Serenade"
I used different dies for the label and swirls. with glitter. You can't see it on the pictures bud believe me, the image shine very well. And off course I have colored with Copic Markers. Franz from Italy again to share another of my projects. 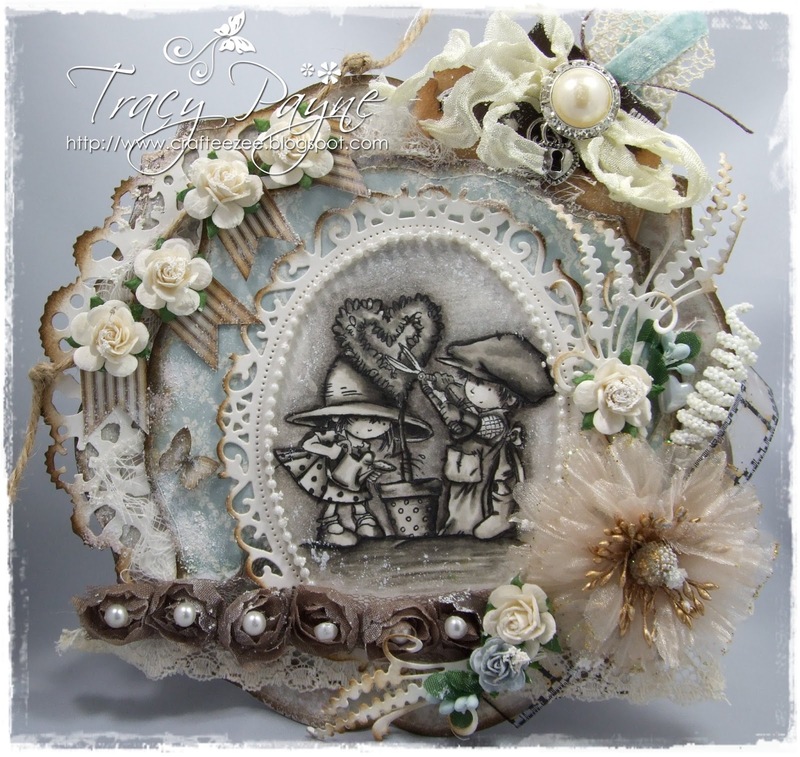 I wanted to use a "Craft and Me" image for a long time and finally I chose this one for today's post, she's called "Casting down". I think she's so romantic and charming, love her dress and all those hearts blown away, I'm a romantic girl, what can I do?!! Her hair is coloured up with my usual and favourite brown colour combo: E21-E25-E29-E49. I was inspired to use BV copics for her dress, tried to give dimensionality to it, using the darkest tones on the parts that I think are behind her legs (I mean the back of her skirt). To achieve this I finally added little touches of black too; I love using it sometimes, but have to be very carefull not to spoil the result at the end! 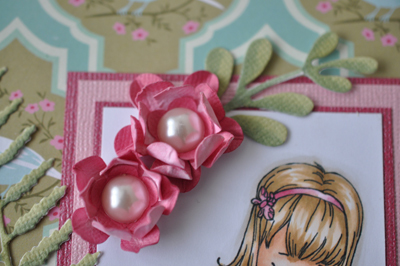 I’ve used papers from “Pion Design" design this time, lot of flowers and some fab little swirls from Prima, I love them! 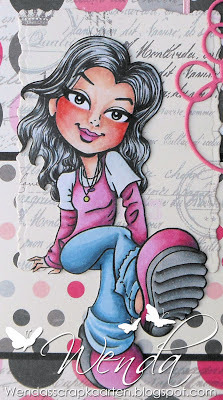 Prima Mini Swirls - "Say it in Cristal"
Today I have published our new blog design. a very beautiful card for us a few weeks ago. 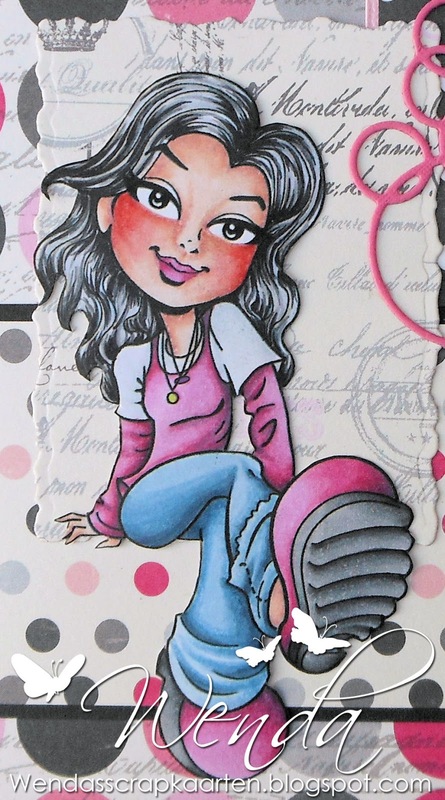 I have used her lovely card to create this new background. I hope you love our new look as much we love our new look. 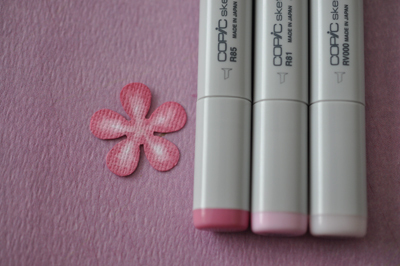 Hello Copics fans how are you all? Vicky here today with my first post of 2013. This is 'Tara', isn't she so pretty. I kept the papers light as I wanted the image to be main focus. I coloured her in the same colours the artist did but I didnt do her hair as light. Face - E13, E21, E00, E000, E0000 & R20 for the cheeks & R85 for the lips. The background I used G000 & the blender pen again to make it faded in places. I then added White Liquid Pearls to the berries. She was then matted onto a Spellbinder die-cut in grey card which I also dabbed with white Gesso. 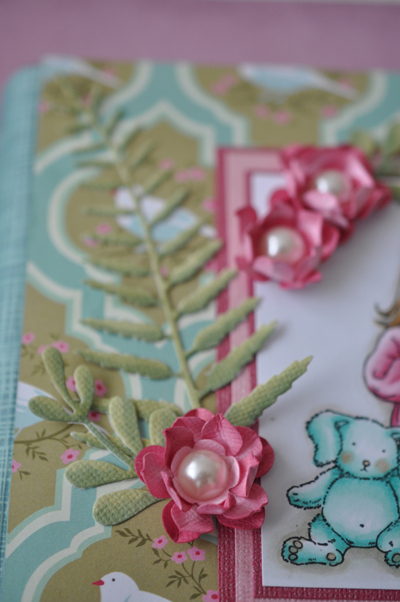 I have used Pion Papers, I love these papers, lovely lace, scalloped pearls & some gorgeous flowers on top of some Memory Box die-cuts. I kept the flowers in neutral tones again to let the image shine out. 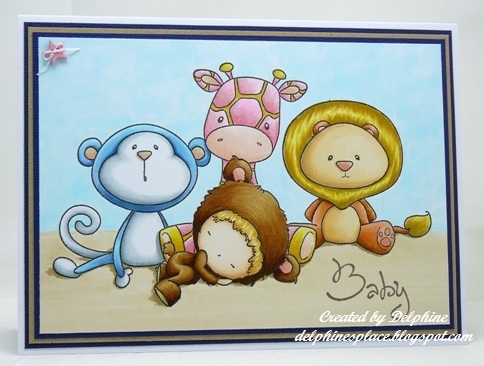 This card seemed to flow together so nicely & the image I really enjoyed colouring. If like me you love hair & faces then Karen Middleton & Hannah Lynn do wonderful images for this kind of colouring. 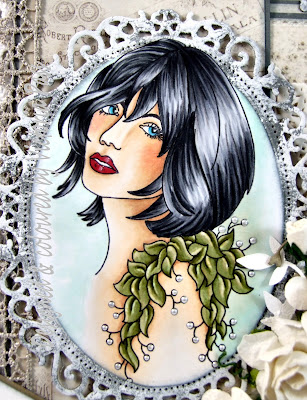 They are fabulous if you want to practice hair colouring as well as skin colouring & shading. I know I am very late with this announchment, but better now than never. 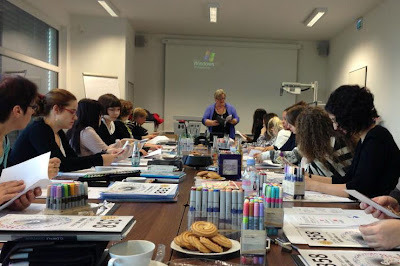 On Wednesday the 14 of November we had a Copic Instructor Class with 12 people, I was assisted by my Instructors Keren, Doreen and Barbara. 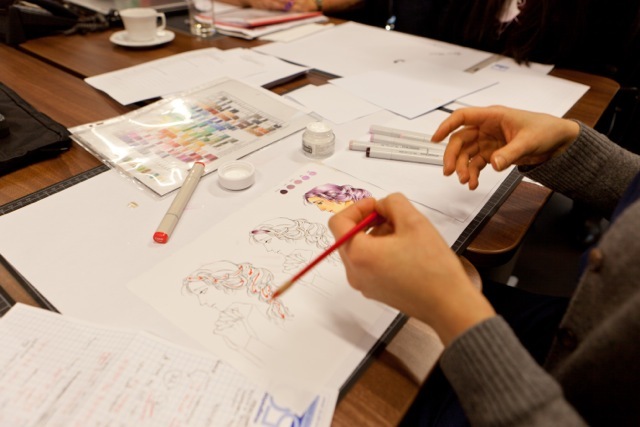 On Tuesday the attendees already followed classes from the European Copic Colouring Program. On the Instructor Class, one day later, they al had the task to give a brief explanation of a certain "Copic Topic". Laura from Finland is explaning us how she colours hair. After completing the class we now have 9 new Copic Instructors. 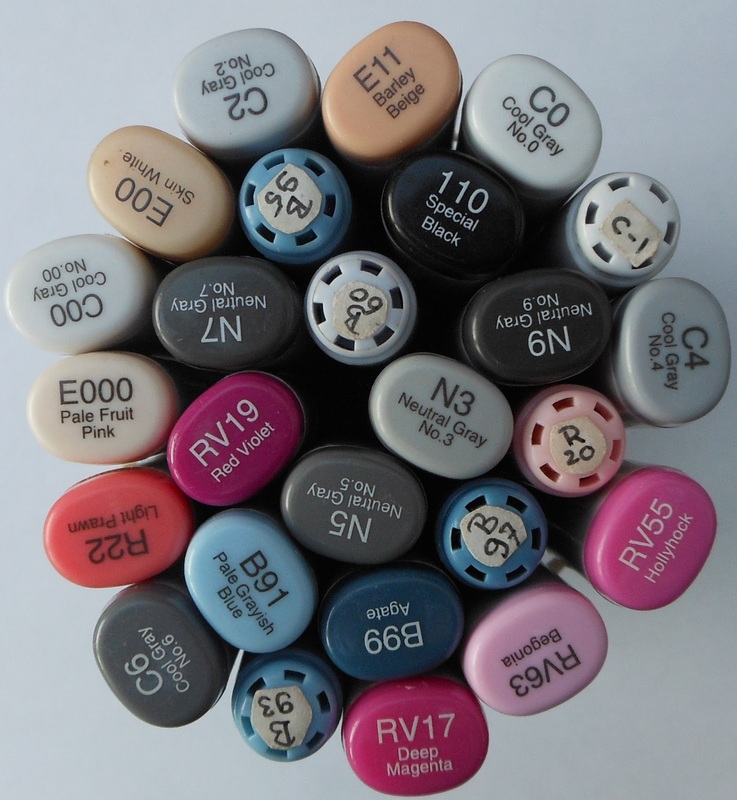 The European Copic community is very happy with them. Laura, Maria, Yvonne, Alix, Isabelle, Magali, Manuela, Heidi, Helena congratulations!!!! If you want information about classes, certifications a.s.o. please get in contact with your Regional Instructor, the emaillink is on the left side of this blog. Norway, Finland, Sweden, Danmark, the Netherlands, United Kingdom, Germany, France, Switserland, Israel and the Middle East. On Thursday we had a very interesting Conference wit all the European Copic Instructors, who were able to come. Wetalked a lot and made plans for the upcoming year, completed the European Coloring Program. We already set the date for the next Conference in 2013. On the 13 November there will be an Instructor Class in Wiesbaden Germany. 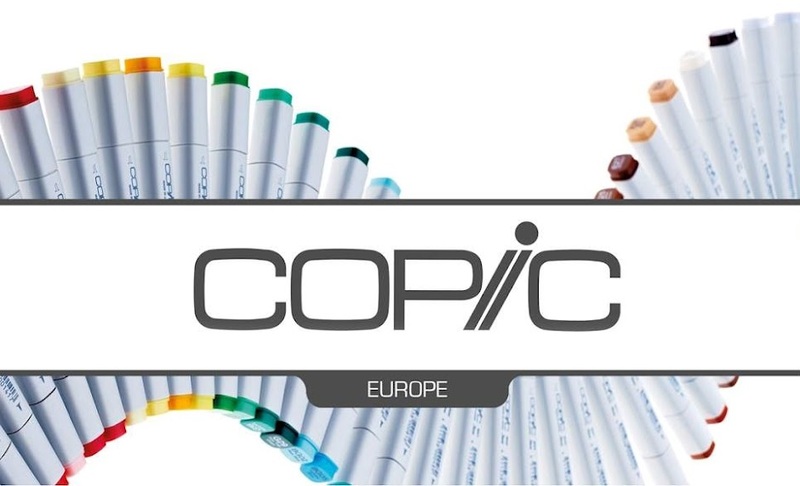 Application only by invitation of the Copic-distributor of your country. 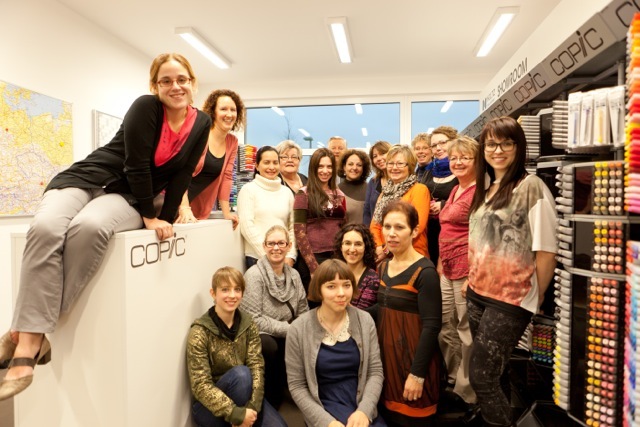 With the 19 Copic Instructors we hope to inspire and help every Copic-lover in Europe and Israel and the Middle East. here am I again. Did not post cards the last weeks, therefore I have a special card for you now, with 4 coloured images. Perhaps you have seen these images called: So Adorable Vintage, there are six of them. The manufacturer is Sugar Nellie. In the digital images the shadow is already indicated, to make it easy for us to colour them. The light outlining gives them also a little bit the idea of colouring without lines. I immediately was falling in love with this type of card, during one my Copic Colouring Classes a student showed it. 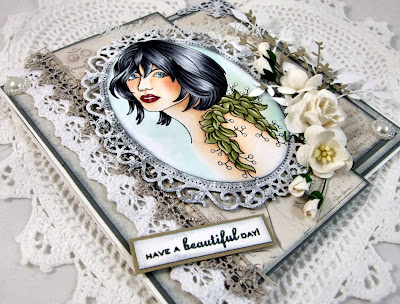 In this card you can place two or four images, Norma from the blog frommycraftroom has a great tutorial on het blog, look at the tab tutorials and find a lot of nice cards and other ideas. My friend Annie and I started again with a crafting afternoon, ones a week. The first thing we made were two of these cards. 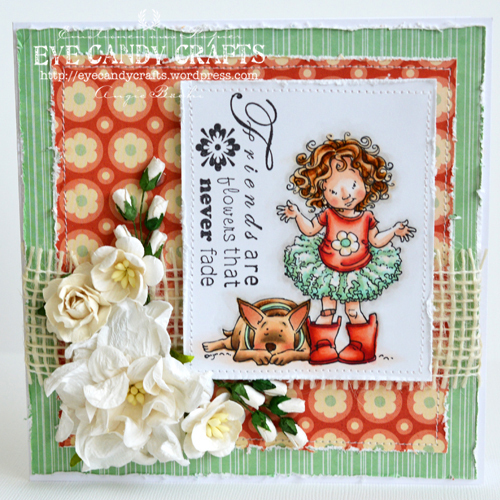 I have used Pion papers, love the colors of this line. The leaves at the front are made with dies from Noor-design and Cottage Cutz. 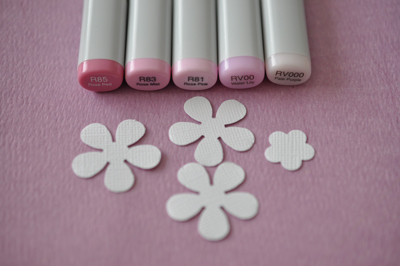 De nice white flowers are made with one of the five new Noor flower die-sets, they will be released end of Januari. I made an extra hole in the top of flowers leaves. The clothing and the flowers are made with the Copic markers from the V-20 group. To colour these faces was a great practice in colouring hair, my favorite part of an image. I hope you enjoyed watching them and I wish you a lot of colouring -fun. Do you want to learn to color with Copics, the way we show it here, watch the announcements on the country-blogs from Germany, Norway and the Benelux. Don't wait to long, because I know the classes in Norway are almost filled. Did you know there is a DT Call for the German-blog? So, now I want to thank you for coming by. Have a great day. 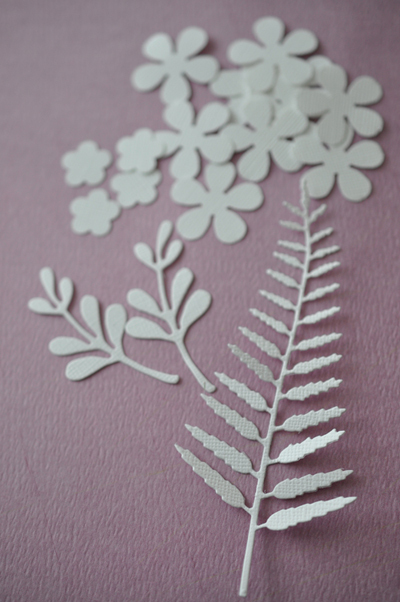 To create these, I've punched several Flowers and Leafs out of white Bazill Paper. And now I've coloured the flowers in different shades of pink. Some lighter and some darker, to get a natural effect. I just love how easy it is to blend colours with Copic Markers... :D Rather sharp or soft blending... everything is possible... the way you like. I also coloured the backside of the flowers with a middle tone. 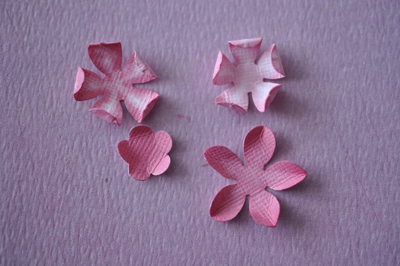 I sticked them together in several layers and formed the flower leafs. Then added a pearl in the center to give it that romantic touch. This is Kathrin here today - after quite a while without crafting or internet I am back. And so I am happy to type today's inspiration post for you. Hier ist Kathrin - und nach einiger bastel- und internetloser Zeit bin ich endlich zurück. Und darum freut es mich besonders, dass ich den heutigen Inspirations-Post für Euch schreiben darf. I hope you aren't too sick of christmas cards - because this is exactly what I have to show today: a christmas card... You can never be to early, can't you? And I used no traditional colors. Ich hoffe, Ihr seid nicht zu froh, keine Weihnachtskarten mehr sehen zu müssen. Denn das ist genau das, was ich Euch heute zeigen möchte: eine Weihnachtskarte. Naja, man kann nie zu früh dran sein. Und ich habe keine traditionellen Farben verwendet. Besides the different shades of green I also used some black to make the shadows deeper. Ich habe neben den verschiedenen Grüntönen auch schwarz verwendet, um die Schatten noch tiefer ausfallen zu lassen. The card itself has been made using papers by Magnolia and GCD, the poinsettia die and the leafes are by Magnolia as well. The saying is a stamp by Catslife press. I also added some Crackle Paint to the edges of my papers. Die Karte habe ich mit Papieren von Magnolia und GCD verziert, die Weihnachtsstern-Stanze und die Blätter sind ebenfalls von Magnolia. Der Text ist von Catslife Press. I habe außerdem die Ränder meiner Papiere mit Crackle Paint eingestrichen. So, hope you liked my card - and am wishing all of you a happy day! Ich hoffe, Euch gefällt meine Karte, und ich wünsche Euch einen tollen Tag! I wanted to work with pink colors and I think that has succeeded. For the paper I have choosen one with dots. These dots can be found back in the part I made with a die of Memory box. 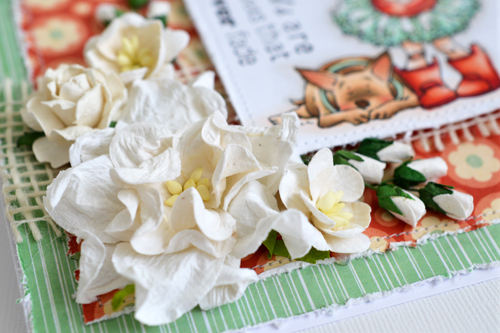 The roses are made with a stans of My favorite things and after punching out you can roll them till these beautiful roses, easy to make and lovely to use on cards. 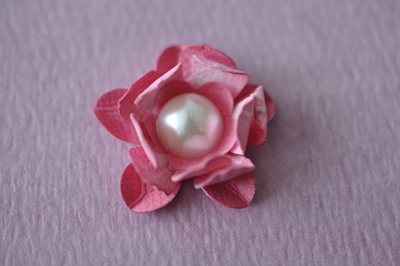 Besides, these kind of dies are handy to use the small scraps of paper. It's me again, Barbara/Kreativmonster and before I start the new challenge for you, I have some news for you. 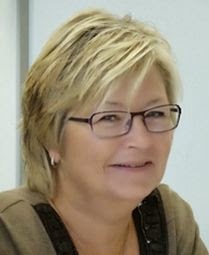 Ich bin's wieder, Barbara/Kreativmonster, und bevor ich die neue Challenge für euch starte, habe ich Neuigkeiten für euch, die besonders für unsere deutschsprachigen Leser interssant sein könnten. This is why there will be no more german translation of posts and tutorials from now on. We would be very happy about your visits at all of our blogs, because they are all different, only the love of Copic Markers is common to all of them. Deshalb wird es ab morgen auch keine deutschen Übersetzungen aller Posts und Tutorial hier mehr geben. 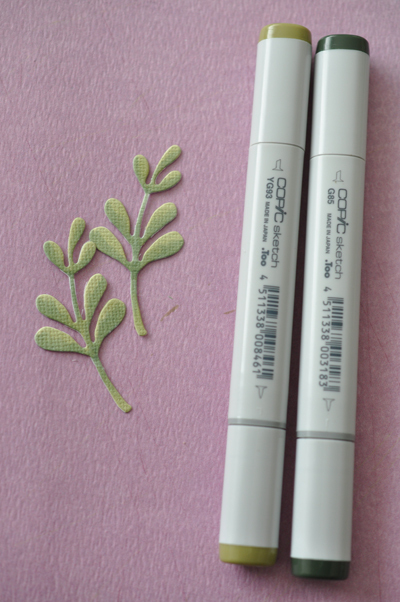 Wir würden uns freuen, wenn ihr alle unsere Blogs besuchen würdet, denn sie sind alle unterschiedlich, nur die Liebe zu Copic Markern ist überall dabei. 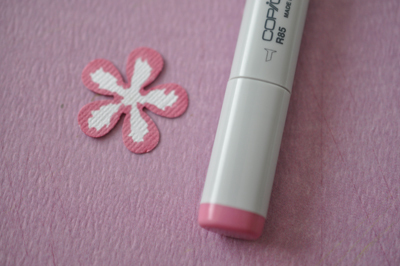 Of course, we want you to visit this blog, too, so let's start our new Copic Marker Europe Blog Challenge. 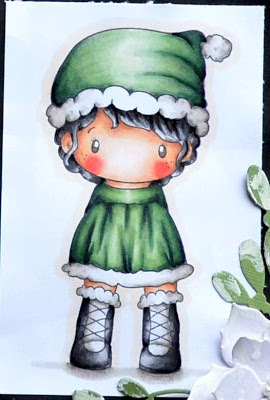 As we have all made so many Christmas projects and cards during the last few weeks, there must be a lot of other projects and cards waiting to be created. Natürlich möchten wir auch, dass ihr weiterhin diesen Blog besucht, daher nun zur Copic Marker Europe Blog Challenge. Nachdem wir alle in den letzten Wochen so viele Weihnachtsprojekte und -karten gemacht haben, warten bestimmt viele andere Projekte und Karten darauf, gebastelt zu werden. of your choice. 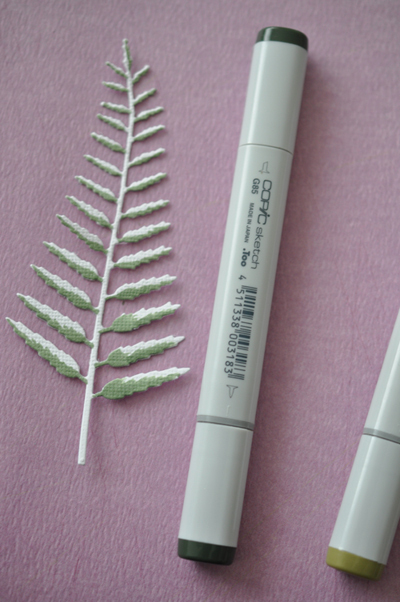 As usual, we want you to use your Copics for your project. 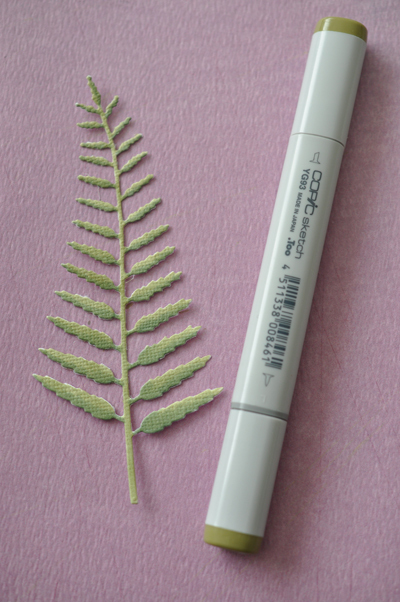 dass ihr eure Copics für euer Projekt verwendet. Nordafrika und dem Mittleren Osten leben. before the end of 14 February. The winner will be announced on Wednesday, 20.02.2013. Auf unserer Challenge Page könnt ihr euch eintragen. Teilnahmeschluss ist der 14. 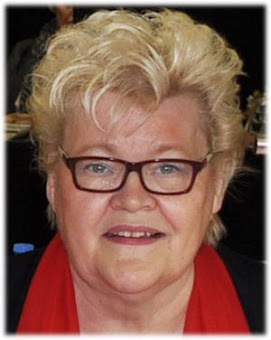 Februar 2013. Der Gewinner wird am Mittwoch, dem 20.02.2013, bekannt gegeben. Wir freuen uns darauf, eure Werke zu sehen!